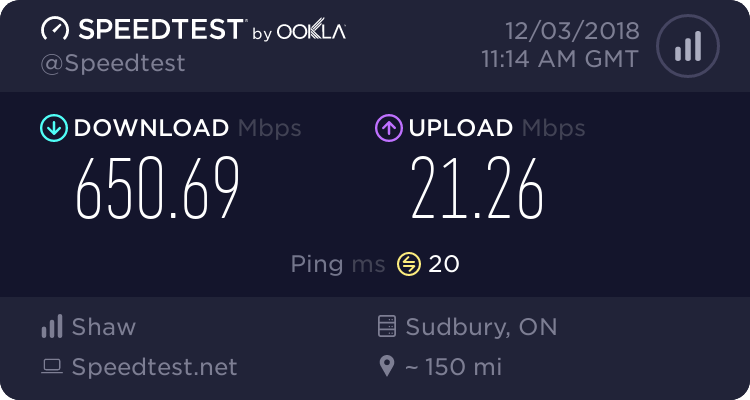 Is there a list of Provinces where the free speed upgrade to 300 and 600 is going to be applied? I am a bit confused about this announcement. The confusion is that Western Canada is Alberta, British Columbia, Manitoba and Saskatchewan. I am in Ontario, on a 300 plan not in Western Canada. Going by the second statement, I should be upgraded since it says "all new and existing internet 300 customers", but going by the first statement I am not going to be upgraded since I am not located in a Western province. They should really clarify what they mean with "western Canada" because those 2 lines are conflicting each other. You will get it, its across Shaw's entire footprint. IIRC the part of Ontario that has Shaw, piggybacks off Winnipeg. Last time i saw, ON customers had wp.shawcable.net DNS servers.